Rich's Automotive and Truck Repair, Inc.
"Over a decade of service to South St. Louis"
Our experienced, ASE certified technicians are trained to provide customers with quality service. Specializing in electrical, computer diagnostics. Experienced in brakes, front end, shocks and struts, engines, tires, air conditioning, clutches, transmission, performance and general maintenance. Independently owned and operated since March 1991. © 2012 Rich's Automotive & Truck Repair, Inc.. All rights reserved worldwide. 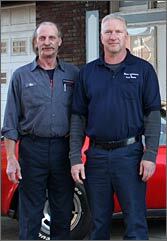 ASE Certified Technicians Ken and Rich have over 85 years combined experience!